ADRA Germany campaign reaches new heights in 2017. 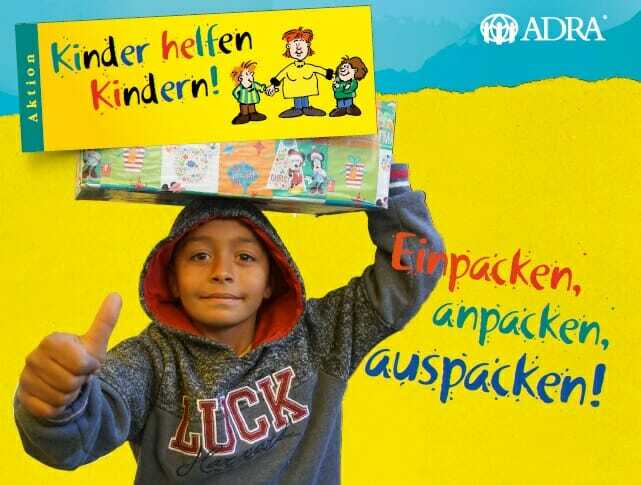 For 18 years, children in Germany have been packing gift packages for needy children in Eastern Europe through the “Aktion Kinder helfen Kindern” [Children Helping Children Initiative] campaign, organized by Adventist Development and Disaster Relief (ADRA) Germany. The 2017 Christmas campaign has given children a total of 34,539 packages and 4,196 large boxes with additional donations. The packages went to Albania, Bosnia-Herzegovina, Bulgaria, Kosovo, Lithuania, Macedonia, Serbia, and Belarus. The shipments also included 1,864 packages and 50 boxes from the Netherlands, as well as 460 packages and 27 large boxes from Luxembourg. ADRA Switzerland also sent 3,355 Christmas parcels to Moldova. ADRA Austria brought 6,302 gift consignments to Albania and Latvia.